Are you a high school student getting ready for college, or do you know someone who is? Do you have access to a helpful college guidance counselor? If not, who do you turn to? And how much are you willing to pay to access such help? Cofounders Daniel Rodriguez, Eric Allen, and Kofi Kankam decided to create Admit.me as an answer to these questions. “We are addressing the issue of there being too few guidance counselors for too many students,” says Kankam. Back in high school, Kankam was one of these students who did not get enough help from a guidance counselor for college advice. He was encouraged to apply and go to Harvard University after encouragement from a visiting Harvard student. “Half the kids in our high schools in the States are college ready, and don’t go,” says Kankam. Admit.me links up high school with college students, alumni, and experts, who would give them the feedback and support they need for an affordable price. High school students only need to create a profile, and they are given feedback and information such as whether their target schools match their GPA, or what other schools to consider in terms of their interests and major. Basically, every piece of information relevant in the college application process. “We’re really trying to make sure that the playing field is level for kids,” says Kankam. Signing up is free. But, applicants can subscribe for increase access to universities and experts on an exclusive content. For example, an interested applicant can “buy” the time of an expert for more information about a college. Picking the correct college will help students avoid facing issues like transferring and losing credit, incurring debt, and missing graduation. And it’s a problem that the founders don’t want students to face, which is why they are reaching out to these college students, alumni, and experts to help them help the students through Facebook ads and referrals. Since launching December last year, they now represent over 125 colleges and 45 high schools, and supported by The Maryland Technology Development Corporation. They are also partnered with some college education and admissions groups like Teach For America and The Princeton Review. 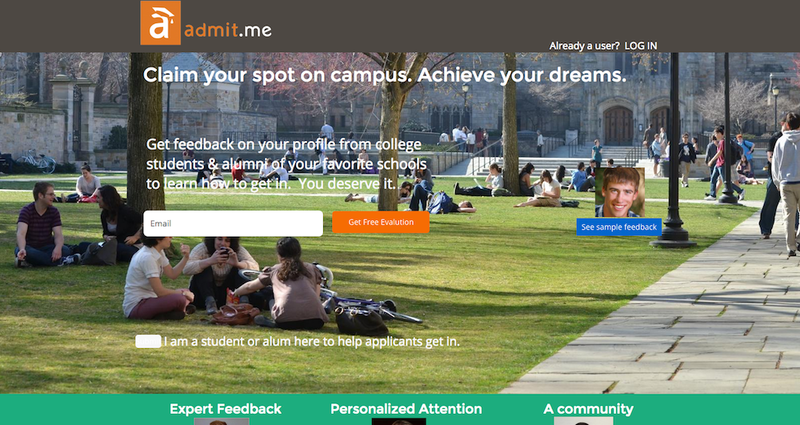 Admit.me now have more than 1,000 users and will be starting a pilot at public schools in Baltimore this Fall. They are also hoping to expand internationally.